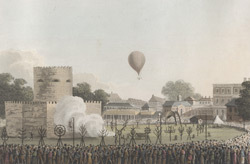 As part of the 1814 peace celebrations, a gothic castle was erected in Green Park. An impressive array of fireworks was let off from the battlements, engulfing the castle in dense smoke. When the smoke had cleared, to the amazement of the crowd, a new building emerged - a brightly lit and lavishly decorated classical temple. A hot air balloon was also launched above the park.